This high thread count, 100% cotton pillowcase for your body pillow is more comfortable and durable than lower thread count pillow cases. 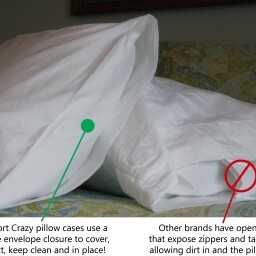 The zipper less enclosed end keeps the pillow in place and clean while making the pillow more beautiful. REMARKABLE SATEEN WEAVE of hypoallergenic 100% long staple combed cotton for a silky smooth surface with a luminous sheen. HIGHEST QUALITY 400 THREAD COUNT provides the best in durability, breathability, and softness all night long! EASY TO WRAP in gift quality packaging. Much easier to wrap than an entire body pillow! PERFECTLY SIZED as the most beautifully fitting body pillowcases for your 54 inch long body pillow. UNIQUELY DESIGNED envelope closure to cover, protect, and keep your body pillow clean and in place. No more zippers and no more escaping pillows!